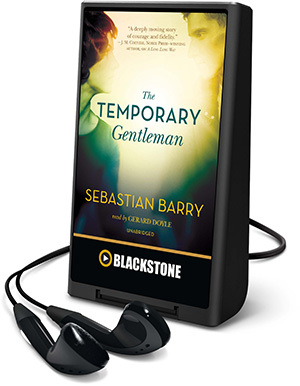 Playaway is the only format of audiobook that does not require a separate player – it comes ready to listen to. It allows you to control the speed of the narrator’s voice and automatically remembers your place if you turn it off. Playaway comes pre-loaded with great content. Just plug in your headphones and listen wherever you go! How do I borrow Playaways in the library? Playaways are located on the shelves with our audiobooks. Please ask if you cannot find them. To find Playaways in the catalogue search by keyword “playaway”, subject “audiobook” or title or author. The size of the collection at each library is quite small, but we add new titles each month. We currently hold only Adult titles. Playaway is about half the size of a deck of cards and holds up to 80 hours of play time. Adult Playaways cost $2 for four weeks (concession card free) and you can get a loyalty card which will get you your sixth Playaway loan for free. 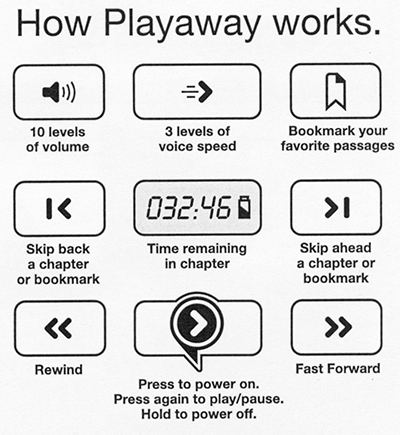 How to listen to your Playaway book? All units have simple instructions on the inside of the front cover or the back of the case. To move through the chapters, quickly tap the FFWD or Reverse button up or down. To rewind or forward the story a short distance, hold down the FFWD or Reverse button. Playaway comes with a universal headphone jack that allows you to use it with a number of accessories including portable speakers, FM transmitters and audio cables. You can use earbuds, or you can plug Playaways into portable speakers or an FM transmitter for use in the car, provided you have a standard headphone jack to plug into the Playaway unit. Because of hygiene they don’t come with earbuds, but you can purchase earbuds from the library for $2.50. The Playaway LCD has a small battery icon that is displayed on screen. There are a maximum of three levels of battery life reflected in the icon. When one bar is left on the battery icon, you have 20% power left. When we issue Playaway to you it will be preloaded wit h a standard AAA battery that has at least two bars of life. Any additional batteries required to complete the story must be provided by the borrower. Why can’t I add, delete or transfer content on or from a Playaway? To protect the copyrighted works of authors and publishers. The Playaway will not turn on. What do I do? Try inserting a fresh battery. If the player still does not turn on, please return it to the library and tell us about the problem. What do I do if the Playaway locks up? Turn it on and off; if that doesn’t solve the problem, remove and reinsert the battery. How do you replace the battery? At the base of the unit, press the tab with your thumb nail. The case opens so you can remove the battery and replace it with a new one. Please dispose of any used batteries in an environmentally friendly way.